Blue Chip Medical CPAP PILLOW FOR BACK OR SIDE SLEEPERS, Ultra-soft CPAP Pillow Case included! CPAP Pillow Comfort & Convenience Unique contoured cut-out design allows the CPAP mask and hosing to move without the restriction created by a standard bed pillow. Promotes comfort and alleviates the discomfort of sleeping with a CPAP or BI-PAP machine. Whether you are a back, side or stomach sleeper, the specially designed CPAP pillow promotes restful sleep and proper neck and spinal alignment. The CPAP pillow helps to prevent mask leakage, soreness and red marks associated with the masks compression against the face. The CPAP helps to promote proper therapy so you wake rested and ready to take on the day. 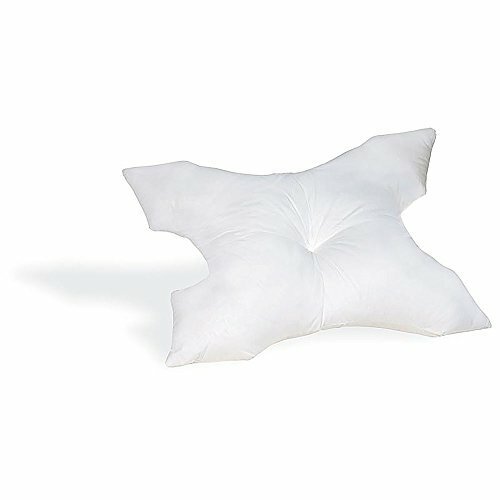 Our pillow is MADE IN THE USA from all US sourced materials to medical grade standards. This ensures the safety,durability and health of our cover and hypo-allergenic, high-lofted, polyester fiber fill. The pillow is covered in a soft white poly/cotton cover. Since a regular pillow case would defeat the purpose of the special CPAP contours WE INCLUDE AN ULTRA-SOFT PILLOW CASE. Our CPAP pillow case is made from an ultra-soft poly/cotton and is made to fit our CPAP pillow perfectly! When constructing our CPAP pillow to prevent hose restriction, improve comfort and sleep, use we found our 25" x 16" x 4" size to be the most comfortable and the most effective at preventing hose and mask restriction. 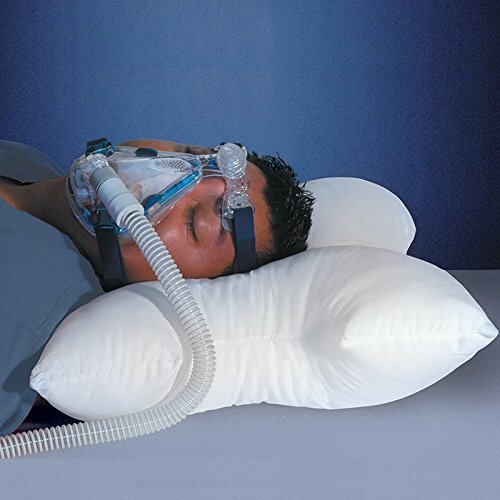 To make our CPAP pillow much larger would defeat its purpose, cause hoses to restrict, the face mask to be uncomfortable and to disturb sleep. Unlike chemical based Polyurethane Foam CPAP pillows, which give off noxious odors in your face, our pillows are made from odor free, hypo-allergenic, medical grade fiber. This makes our pillow healthy, resilient, effective and incredibly comfortable. Beware of cheap look-a-like imports.